Writing is often considered a solitary pursuit — and yet there are examples of writers and other creative sorts banding together, bound by a common place, philosophy or type of output. For those groups, very often the commonality and camaraderie can inspire greater work than isolation. 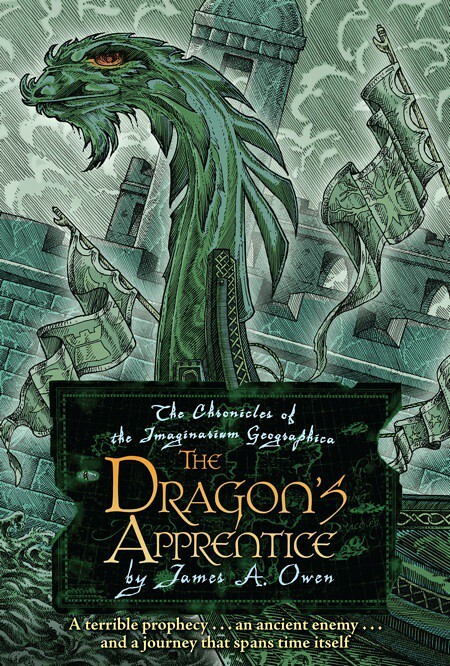 It’s this idea that James A. Owen is thinking about in today’s Big Idea, and how his own experience of camaraderie, first experienced in his early days as an illustrator, expresses itself in his “Chronicles of the Imaginarium Geographica” series, of which the newly-released The Dragon’s Apprentice is the latest installment. I have always been fascinated by the idea of artists and writers – creatives – in community. Part of that is due to my upbringing: my mother, a teacher, also painted – but her oldest brother was a full-time artist; the second eldest brother was a printer; and her younger sister was a graphic designer. More, the family history was laden with ancestors who were artists, which also instilled in me an appreciation for a creative heritage. So my senses were already acutely attuned to other examples of creatives in community – and there were plenty to be found. Artistically, the Pre-Raphaelite Brotherhood stood above the pack, if only because they also defined themselves as a “community”. There was also the Wyeth Dynasty, which actually began with Howard Pyle and N.C. Wyeth, then continued through N.C.’s son Andrew and grandson Jamie. And more recently, there was the Studio quartet of Jeffrey Jones, Barry Windsor-Smith, Berni Wrightson, and Michael Kaluta, who not only inspired me as an illustrator, but also in how they chose to establish a creative space where separately, they could do their work, and collectively, they could midwife a legacy whose myth was larger than the reality. In literature, there were just as many examples of friendships, associations, and, often, rivalries: Twain and Stevenson; The Shelleys and their circle of poets; Shakespeare and Kit Marlowe; and, most famously, the world famous Inklings. That J.R.R. Tolkien and C.S. Lewis were not only friends but had actively shared their creative processes as they developed The Lord of the Rings and The Chronicles Of Narnia was utterly fascinating to me. And that others among their academic and social circle were permitted to share in these discussions was thrilling – because it meant that creating these great works was not something done through unknowable, arcane processes by untouchable demigods, but rather was something done through an entirely human process of trial and error and effort, by fallible men and women who had touched a spark of divinity and fanned it to a flame with the accelerating invocation, “let me tell you a story”. When I became a professional in the comics field – which happened when I was a lot younger than most people realize – I went into it with the mindset that the best creative work would spring from an environment where I associated with like-minded creators. And so I naturally gravitated towards friendships and professional associations with people who had been in other communities of creatives; artists and writers who had shared studios. Paul Chadwick and Bil Stout became friends of mine, as did the Studio Quartet themselves. The Self-Publishing crowd of the mid 90’s – Jeff Smith, Dave Sim, Colleen Doran, Rick Veitch, Steve Bissette, Terry Moore, and Paul Pope, among others – helped me define both my public persona and my professional identity. And even now, I can attend a convention in Belgium or Italy or Finland and instantly be united as a community with other guests, because even as Strangers in a Strange Land, we have common reference points of language, and history, and heritage. And bonds created by those shared points of reference can last for a lifetime. So it was all of that which was the mental landscape in the background of my mind when I took a throwaway line from one of my Mythworld novels and decided to create a series about it. It was in the middle of a description of a fantastic library, and referenced a book of maps of imaginary lands, which had once been owned by H.G. Wells. And it was too good an idea to resist. I built upon that one idea, and structured around it my love of creatives in community. If Wells had indeed owned such a book, what would he do with it? And more importantly, who would have given it to him? The answer to the second question was easy and fun – another creative, a Caretaker of the atlas (now called the Imaginarium Geographica) would have entrusted it to him, after having found him a worthy guardian of the heritage it represented. And the answer to the second question is how I began the first book in the series of The Chronicles of the Imaginarium Geographica, called HERE, THERE BE DRAGONS. The subsequent books, THE SEARCH FOR THE RED DRAGON, THE INDIGO KING, and THE SHADOW DRAGONS not only took readers into the lands depicted on the maps in the Geographica, but also deepened the concept of what it meant to be a Caretaker, and established the idea that the heritage of the Caretakers was as long as human history. Men and women from the arts and sciences throughout the ages were called upon, enlisted, or sometimes, simply forced to become Caretakers of the greatest open secret in the world. And more, the “real” adventures they had as Caretakers could become the basis for their publicly-known works here in the mundane world. This concept alone allowed me to co-opt all of history, science, art, and literature as source material for my stories. And anyone who has ever seen the afterparty at a comics or SF convention would recognize the gathering of the Caretakers Emeriti in Book Four. The newest book, fifth in the series, called THE DRAGON’S APPRENTICE, deals with the inevitable transition: eventually, all new Cartakers become old Caretakers. All creatives become, at some point, part of the mythology that inspires the new generation. But still, the heritage is the same. The community endures. And maybe that’s the Big Idea – everyone has a story. Which means that if they choose, anyone can be a part of the community of creatives; anyone could be a Caretaker. All they have to do is invoke that magic phrase that Verne, and Wells, and Tolkien, and Lewis all spoke before them: “Let me tell you a story”. The rest, as they say, is history. Or at least, it will be. Visit the publisher’s book page, which features book and audio excerpts.